CARDINAL CUSHING CENTERS : ACT OF KINDNESS AWARD presented by Cardinal Cushing Centers President/CEO, Board Chair and Sisters of St. Francis of Assisi "for going above and beyond the call of duty for the individuals with disabilities...at Cardinal Cushing Centers." - Received April 17, 2014. 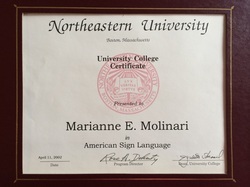 NORTHEASTERN UNIVERSITY AMERICAN SIGN LANGUAGE CERTIFICATION - Received April 11, 2002. READS Collaborative CERTIFICATE OF RECOGNITION presented by The READS Collaborative Leadership Team - Received May 13, 2013. 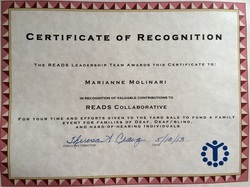 Presented to Marianne Molinari in recognition of valuable contributions to READS. MASSACHUSETTS STATE ASSOCIATION OF THE DEAF: THOMAS H. GALLAUDET SERVICE AWARD - Received November 5, 2011. "In appreciation of your work as a hearing ally for your many contributions and involvement with resources, communication access and education to benefit Deaf, hard of hearing and hearing Community." 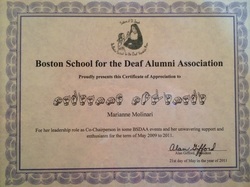 BOSTON SCHOOL FOR THE DEAF ALUMNI ASSOCIATION CERTIFICATE OF APPRECIATION presented by Alan Gifford (BSDAA President) - Received May 21, 2011. Presented to Marianne Molinari in recognition of her leadership role as Co-Chairperson in some BSDAA events and her support for May 2009-2011 term. PLYMOUTH COUNTY EDUCATION ASSOCIATION DISTINGUISHED SERVICE AWARD presented by Chairperson Recognition Committee- Received for 2008-2009 period. 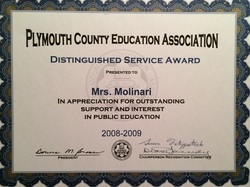 Presented to Marianne Molinari in appreciation for outstanding support & interest in public education. 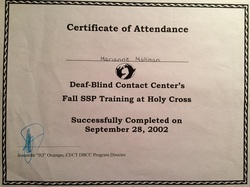 HOLY CROSS CERTIFICATE OF ATTENDANCE for Deaf-Blind SSP Training- Received September 28, 2002. 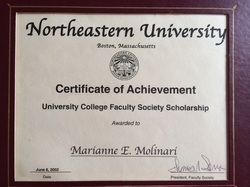 NORTHEASTERN UNIVERSITY CERTIFICATE OF ACHIEVEMENT presented by NEU Faculty Society- Received June 6, 2002. 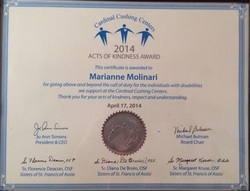 Presented to Marianne Molinari in recognition of high honors & academic achievement. of the Deaf - Received November 5, 2011.